A postcard of the Municipal Lighting plant. Photo courtesy the Edward Bellamy Memorial Assocation archives. CHICOPEE - I was on Front Street in Chicopee recently, heading into City Hall when a Chicopee Electric Light truck passed, heading toward the new Davitt Bridge. The impressive vehicle reminded me of the city’s historic role in the continuing success of New England’s municipally owned power companies. The department’s creation 119 years ago remains to this day a legacy of the 19th century’s Progressive Era. The organization of a new society depicted by Edward Bellamy in his first Utopian novel, “Looking Backward,” presented a society in which selfishness and individualism have been overcome by the feeling of solidarity and mutual brotherhood. Soon after the book’s publication in 1888, young people, fired by Bellamy’s idealism, organized the first Nationalist Clubs in Boston. Within a short period of time the clubs became a political movement called Nationalism, identified as the Bellamy movement in the literature of the time on a par with socialism and capitalism. About 140 Nationalist Clubs were formed. Reform-minded newspapers sprang up across the nation. The following year a similar law was passed to give municipalities the right to own and operate their own coal yards. The Supreme Judicial Court of Massachusetts quickly declared the law unconstitutional. The court’s dislike for public ownership was clear, but the initial law was allowed to stand. Chicopee’s first mayor, George S. Taylor, was a staunch Republican who was no fan of Edward Bellamy’s Nationalist’s theories. But in the spring of that year, the state Legislature, reacting to the Nationalist lobby, passed an act giving cities and towns the right to purchase an existing electrical plant and transfer it from private to public ownership. In the fall, the new city council (the name was changed to the Board of Aldermen at the turn of the century) gained the necessary two-thirds vote in favor of the purchase of the Chicopee Electric Light Co. plant. The citizens, by a substantial majority vote, confirmed the action and the purchase was ordered. 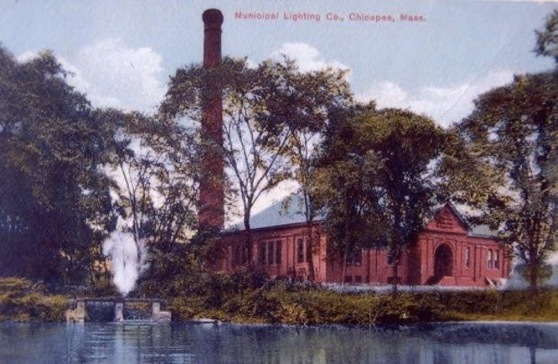 Chicopee became the first city in Massachusetts to own a municipal power station. It was Chicopee’s second mayor, William W. McClench, an insurance executive and businessman, who named a special commission composed of James E. Taylor, James L. Pease and John B. Wood, to take charge of a building program and the task of establishing an electric light department. The plant was constructed in the old Bemis brick yard on Front Street. On May 28, 1896, with the appropriate ceremonies, the plant went on line. When I was growing up in the 1950s, the Chicopee Electric Light Department was the last vestige of the community’s Protestant Yankee heritage. 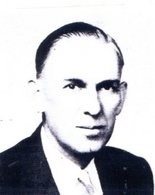 On July 15, 1953, Roy P. Benedict retired as manager after 38 years of service. C. Duncan Brainard, with 34 years of service, succeeded him. John J. Korkosz, with 17 years in the department, took over the duties of assistant manager. 1946 photo of C. Duncan Brainard from the Chicopee Light Dept's 50th anniversary book. Photo courtesy the Edward Bellamy Memorial Assocation archives. Mr. Brainard lived on Gaylord Street, and I was his morning paper boy. I never saw him without a shirt and tie. He was a class guy. His home today is part of the Elms College campus. When Mr. Brainard retired, a first-generation, Polish-American assumed the reins of the city’s flagship department. Mr. Korkosz looked and sounded like his predecessors. He was a most impressive community leader. His son, David, was the president of our graduating class at Chicopee High School. 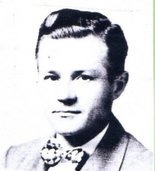 1946 photo of John J. Korkosz from the Chicopee Light Dept's 50th anniversary book. Photo courtesy the Edward Bellamy Memorial Assocation archives. During a recent phone conversation Dave Korkosz recalled one of his dad’s favorite stories. I reminded him that it was one of my favorites, too. Soon after becoming the manager, Mr. Korkosz was visited by the notorious “bagman” for the Board of Aldermen. The man indicated the need for certain financial compensations – “bribes” – to assure the smooth operation of the department. Local legend has it that Korkosz asked his secretary for the Boston telephone number of the U.S. attorney’s office. The rotund politician stumbled out of his chair and never visited the office again. Stephen R. Jendrysik is a member of the Chicopee Historical Society’s board of directors and president of the Edward Bellamy Memorial Association.